HAF dedicates staff time and resources to support grassroots and institutional leaders boldly addressing challenges that affect many lives in the region. Improving the well being of vulnerable and historically marginalized communities has been a particular priority for initiatives that last between 1-10 years. This work is usually undertaken not by one organization with a limited mission, or a sector with a general focus, but co mmonly over time by networks of leaders from a variety of perspectives and experiences who hold a vision of significantly changing how things are done to make desired changes. HAF’s role can vary from serving as occasional facilitators and conveners to providing dedicated staff support for long periods. We do this work with resources from a combination of the Opportunity Fund, directed gifts from donors, grants from partner foundations, and fees for service support. The Equity Alliance of the North Coast is a multi-year initiative of HAF. We invite institutions, nonprofits, businesses and individuals to take on the largely unintended racialized inequities that cause harm to so many families and communities in our region, and that keep every member of our communities, no matter their racial identity, from achieving full potential. Since 2016, steadily increasing demand for this work means that more and more local talent is training and coaching organizations focused on reducing racialized inequities experienced by those they serve. Find out where we’ve been, where we are, and where we’re going. Get access to our top ten starter resources and back-issues of our e-newsletter. In a region with a history of political division, True North Organizing Network is working to carve out space in local, regional and statewide public decision-making for those historically not heard or included. True North resident grassroots leaders believe human dignity is the heart of justice and progress, and that for a true and honest democracy to thrive every person needs the opportunity for their interests to be heard and respected. In 2014, True North leaders and staff participated in a “season of listening,” facilitating over 1000 conversations in communities from Loleta to Smith River to Weitchpec. At the end, 220 people came together to set the course of the organization. United by shared values, community members identified five campaign issues for research and action: Water and the Environment, Immigrant Rights, Police Accountability, Mental Health and Homelessness, and Public Education. To tackle these issues and improve communities for all who call the North Coast home, True North facilitates community organizing that provides resident leaders with the tools, coaching and infrastructure needed to create lasting change. The Native Cultures Fund was established at HAF in 2002 by a group of respected Native culture-bearers who had an interest in providing supports to grassroots efforts to revive native cultural practices and languages that form an important basis of indigenous identity and well being. They started by listening and learning to what was needed in largely northwestern California communities and grew those supports to much of the rest of the state with the partnership of the Irvine and the William H. and Flora Hewlett Foundations. Recently, a generous donor’s bequest established the Jack Montoya Memorial Fund that provides for cultural revitalization grants and scholarships for California native students. In 2018-19, NCF is again on the road listening and learning to native culture bearers and language revivalists to identify how to most effectively support so many hardworking people’s efforts to rebuild strong native identity and practices. We thank the William H. and Flora Hewlett Foundation for their partnership. Come back soon, this page is under construction. In the 1990s, HAF brought together antagonists in the “Timber Wars” to find common ground and heal deep wounds tearing communities and families apart. As the timber industry’s role was shifting from an outsized influence to a moderate role in the region’s economy, HAF helped many disparate economic development efforts form one unified vision, plan and set of actions that resulted in successful, continuing growth of “target” sectors of the economy. HAF supported the arts community to establish itself as a major influence in the culture and experience of north coast residents and visitors. All of these efforts were funded significantly by outside philanthropic partners like the Irvine Foundation and the Wallace Foundation. In the 2000s, HAF convened partners that spearheaded a decade-long effort to establish broadband access and fiber redundancy in our remote and isolated region where (sometimes prolonged) breaks in internet access were limiting consistent access (and still do in many of the most remote parts of the region). Native community members who were starting to revitalize traditions that are a key part of indigenous identity and wellbeing asked HAF to house grants and other supports for this work – efforts that grew into the statewide Native Cultures Fund. 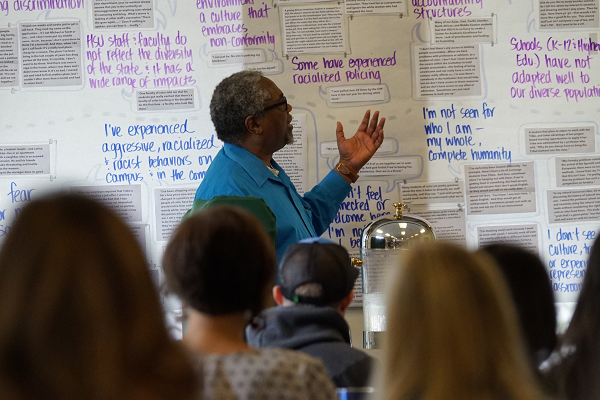 We experimented with a leadership development program and nonprofit technical assistance education to help leaders and nonprofits grow their skills and collaborative effectiveness, which became ongoing programs: Cascadia Center for Leadership and Northern California Association of Nonprofits. Come back soon to read about our work in the 2010s, as local donors started leaving flexible funds that help HAF Community Strategies staff support local social innovators to listen, learn, convene, strategize and solve complex problems together.